Halfway through Jeph Loeb's run on Hulk, I'm finding this whole thing to be a bit of a mixed bag. Maybe it's a case of parts being more than their sum, but for every high point I'm finding I have to wade through a few chapters that just don't hit it for me. Volume 3, Hulk No More, has a fantastic ending, but it's a rebound after a problematic and ultimately lackluster opener. Hulk No More, like its predecessor Red and Green, is divided roughly in half, although the division isn't as neat. Hulk No More begins with a three-parter in which Hulk and Red Hulk are pitted against each other in a cosmic game of "who's tougher," sponsored by The Grandmaster and The Collector. The stakes? 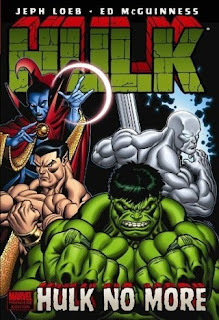 Hulk, Silver Surfer, Doctor Strange, and Namor have all been ripped from the most tragic times in their histories to fight for the lives of the women they love, while Red Hulk and his team of baddies (Terrax, Baron Mordo, and Tiger Shark) stand in their way, apparently just for the hell of it. Then Hulk and Red Hulk square off once more, this time in MODOK's secret government laboratory. It's here that Red Hulk drains Hulk of his gamma energy, stranding him as Bruce Banner and seemingly ending the Hulk's career -- for good. Ed McGuinness rejoins Jeph Loeb for this volume, and while Art Adams and Frank Cho weren't terrible fill-ins, the return of McGuinness feels like stepping into familiar and inviting territory. McGuinness's bold pencils make the Grandmaster/Collector chapters feel appropriately larger than life, a return to the smackdown style of Red Hulk with every flying fist and bulging bicep rendered in double-page spreads and exhilarating action. When inkers Mark Farmer and Tom Palmer step in on the latter chapters, they bring a softer edge to McGuinness than his usual collaborator Dexter Vines, but the change-up (especially with Palmer's inks) is a welcome and intriguing one. There's nothing terribly original about the Grandmaster/Collector storyline, nothing we haven't seen before -- two characters forced to do battle with a team of A-listers behind them, cosmic stakes afoot, cameos by plenty of heavy-hitters (i.e., Galactus, Dormammu) -- and even the ending is fairly standard. At the risk of spoiling it, nothing comes of this storyline. The Grandmaster and the Collector leave, restore any damage done to the characters, and wipe the memory of all involved. DC readers would look at this as an experiment in Elseworlds, a deus ex machina that whitewashes over any continuity problems the story might create. If this were a Hulk miniseries I'd be fine with that, but it's not. As part of the main story, this battle royale ends up taking space away from the main narrative. It's exciting to see Red Hulk dueling Silver Surfer and absorbing his cosmic energy (especially as illustrated by Ed McGuinness), but Loeb has a great thing going here with the mystery of the Red Hulk and his apparently long reach within the Marvel Universe; unfortunately, this plot (like the Wendigo plot from the last volume) is simply a distraction, one that erases itself from continuity, at that. This self-contradiction is exacerbated by the opening pages of the story proper in Hulk No More, in which the reader plays catch-up with Ben Urich, who's writing a story about the government's cover-up on the existence of the Red Hulk. It's an effective technique, but it's highlighted by the fact that we've spent three chapters/issues away from our main storyline. Fortunately, this second half of the book is more relevant and therefore a greater payoff. When Red Hulk drains Hulk and there's no Collector to reset continuity, it portends greater things to come. And with Spider-Man and Norman Osborn both conscious of this change in the Hulk's fate, there's a kind of ripple effect that lets us know Loeb isn't messing around anymore. With confirmation that Hulk is out of the picture, I'm excited to see where this is all going. The book seems to have set aside the mystery of Red Hulk's identity for now, but I'm not so sure that's a bad thing. Ben Urich hangs a lantern when he asks She-Hulk, "Who is the Red Hulk?" and there might be a red herring that Norman Osborn is the Red Hulk (or maybe I'm just reading too much into the close-up of Osborn's enormous hands), but for the most part Loeb seems to be prioritizing momentum over mystery. Keep the action coming, keep the giants clobbering, keep the plot advancing. After a stumble with the cosmic battle royale, the volume quickly rebounds. Is Hulk No More a great book overall? Not really, considering half of the book is a well-drawn waste of time. But am I going to keep reading? You bet your gamma ray shorts I am. Especially if it means I'm going to get more of Audrey Loeb's Lil' Hulks.